In the previous blog posts I described how OSPF tries to solve some broken designs with Forwarding Address field in Type-5 LSA – a kludge that unnecessarily increases the already too-high complexity of OSPF. Update 2017-02-06: Added a few more nerd knobs suggested by Angelos Vassiliou. 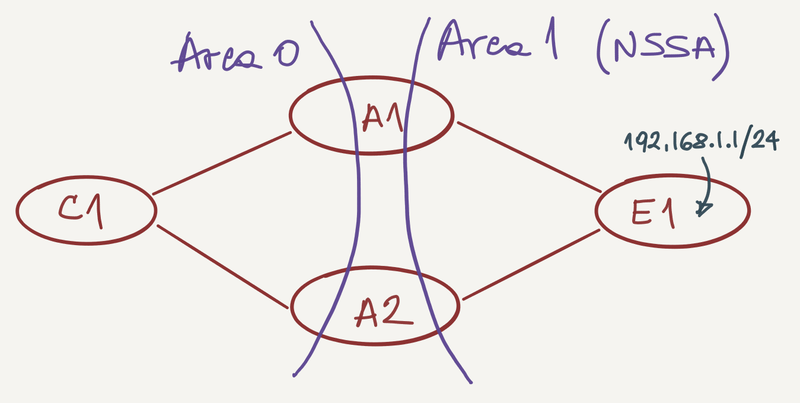 ABRs A1 and A2 connect edge network with core network. Whenever you have multiple ABRs connected to the same set of OSPF areas, you SHOULD have a link between them within each area and within the backbone area. The proof is left as an exercise for the reader. Note: you can implement the backbone link as a virtual link if the non-backbone area is not a stub/NSSA area. Only one of the ABRs advertises Type-5 LSA into the backbone area (because whatever – details in RFC 3101). Without the forwarding address in Type-5 LSA originated by A2 (in our sample network) C1 couldn’t use both equal-cost paths toward E1 (C1-A1-E1 and C1-A2-E1); all the traffic would go through the ABR originating the Type-5 LSA. How does the ABR figure out what forwarding address to use in Type-5 LSA translated from Type-7 LSA? It has no idea and shifts the problem to someone else (see also RFC 1925 rule 6) – it uses whatever forwarding address is specified in Type-7 LSA. Corollary: Type-7 LSA MUST have a Forwarding Address. If you want to reproduce the results, start with OSPF-NSSA-Forwarding-Address VIRL topology from my VIRL Github repository. It doesn’t have a usable loopback address advertised as an internal OSPF route. E1 consequently takes one of its other IP addresses (I’m positive RFC 3101 goes into great details which one to use, but I couldn’t be bothered with those details) and uses it as the forwarding address. In our case, E1 chose the IP address on the E1-A2 link. The change of forwarding address breaks load sharing on C1 as the subnet specified in the forwarding address is no longer reachable over two equal-cost paths. C1 sends all the traffic toward E1 over A2. Hooray, we broke OSPF (again). 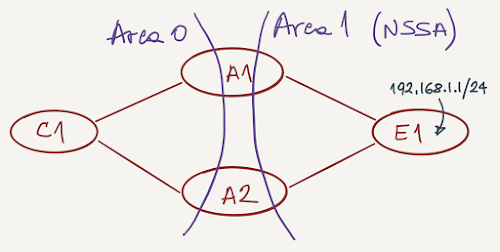 The interesting thing about FA is that since it is used in a recursive lookup and OSPF effectively acts as a distance vector protocol in this case, FA address has to be present in a RIB (and ultimately in a FIB) or external prefix won't be resolved. Fun to troubleshoot! Angelos Vassiliou sent me an email pointing out that we could use area 1 nssa translate type7 always to force both ABRs to originate type-5 LSAs. This would solve some edge cases resulting from discontiguous NSSA area, but would not solve our problem. There's another nerd knob (that in my understanding violates the NSSA RFC): area nssa translate type7 supress-fa would suppress FA information in type-5 LSA originating into the backbone, potentially resulting in ECMP within the backbone, but not in correct end-to-end ECMP in scenarios with unequal-cost links. Do we really have to deal with all this complexity? If your vendor tries to charge you extra for the privilege of using BGP tell them it’s 2017 and vote with your wallet (aka Change the Vendor). You can also use me for a short online consulting session to discuss these challenges or validate your design.